A lot of preparations need to be done to make this theme party a grand and successful one. Let us check these things one by one. Decoration: Glamorous, colorful and glittery are the synonyms for bollywood. 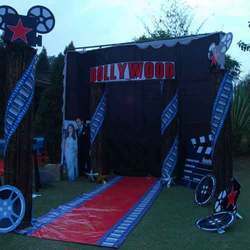 The sizzling and glittering decor can turn a simple party hall into an extravagant movie set. Deck up the party hall with sparkling wall hangings, candles, flowers and rich and silky cushions. Take the photos of actors and actresses and hang them in the form of shining stars. Cover the walls with the posters of latest and hit movies. Colorful and glittering fabric can be used in a creative drape to cover the walls, windows and ceiling and any empty space. Multi colored lights add up to the ambiance. Dress code : As the theme is Bollywood, each and every one is a star today. They can choose to come in any glamorous outfit. But giving a dress code brings the party alive. You can even ask the couples to come dressed as bollywood's hit pairs like Shahrukh Khan - Kajol, Aamir Khan - Juhi Chawla, Saif Ali Khan - Kareena, Madhuri Dikshit - Anil Kapoor and so on. Another fun way is they can wear masks of these stars as they enter and let other guests guess who they are in real. Once done, they can remove off their masks. This is one real exciting way to welcome your guests. Single males can choose the characters like Munna bhai - Circuit (Sanjay Dutt - Arshad Warsi from Munaabhai MBBS), Jai - Veeru (Amitabh - Dharmedra in Sholay) etc. Games : Entertainment-Entertainment-Entertainment is the mantra for the evening. You can plan umpteen number of games to entertain the guests. 1. Bring in some variations in the usual Antakshari and Dumb Sharads. Instead of identification of movies, let the participant enact a song or a signature dance step of a famous song. 2. Mix two audio songs and play. The team identifying first wins the point. 9. Identify the family tree of these stars - Parneeti Chopra, Varun Dhawan, Zayed Khan, Arjun Kapoor, Alia Bhatt etc. 10. Blur the photos of film personalities and project it on the screen. thanks a lot , u rock!! Awesome ideas!! Thanks for sharing. This helped me soooooo much to plan the farewell party in my school ;-) thank you!! !